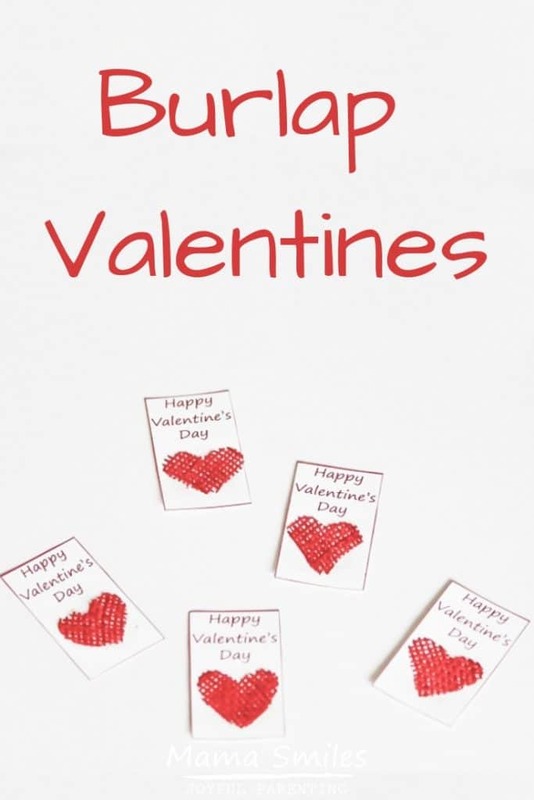 Free Valentine’s Day cards printable – personalize for fun, easy for kids to make valentines for school. We used the printable to make burlap valentines! 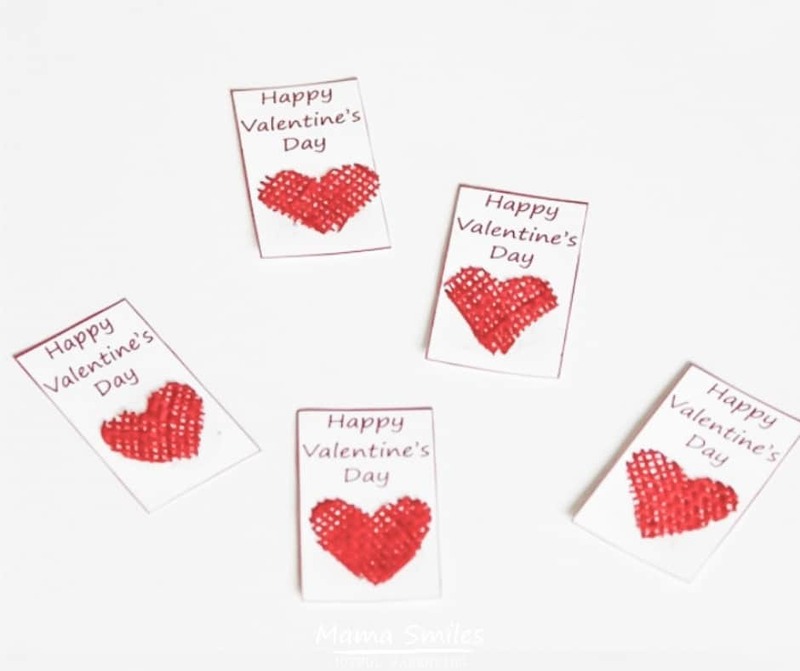 Check out how we used this same printable make stamped valentines. My third grader Emma made these rustic burlap valentines to give to her classmates. I created a printable for the cards, and then we cut the hearts out of burlap ribbon that was sent to us by BurlapFabric.com (they sent us the fabric to use however we wished). I made a couple of printables for the cards – an 8.5 x 11 inch Valentine’s Day card printable for my US friends, and an A4 Valentine’s Day card printable for my European friends. The European version has the text at the bottom of the cards; the US version has the text at the top. You can print the 8.5 x 11 version on A4 paper and vice versa, but a few of the cards will get cut off. We will be using this same printable to make Johnny and Lily’s class cards, but they aren’t using burlap. My kids’ school discourages sending in treats with valentines, so there is plenty of motivation to make a creative card. 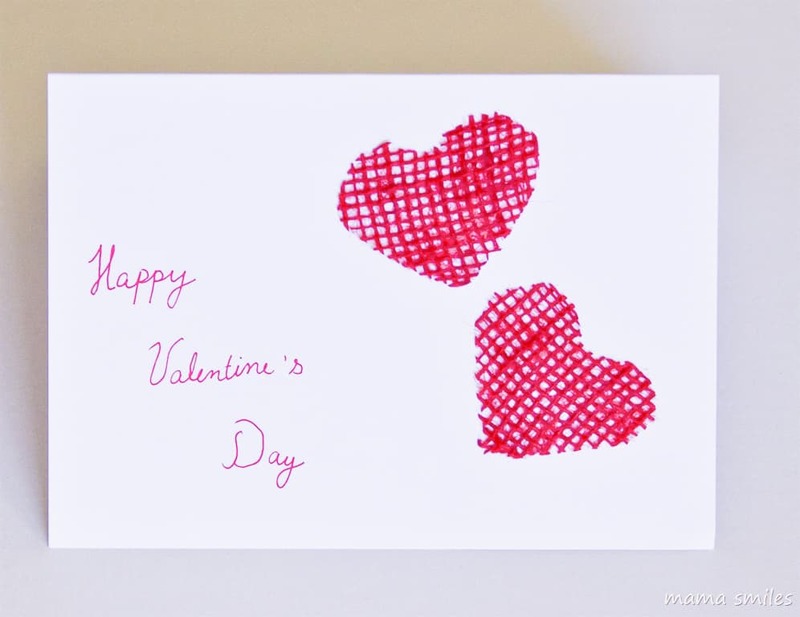 Burlap hearts make great grown-up cards, too! I used Mod Podge to attach the hearts on my card, but that was a little complicated for Emma, so she opted to cover her cards with glue stick glue and then stick on the heart. You have to put the glue stick glue on the card itself, because when you try to spread the glue stick on burlap it starts to unravel. Mod podge can be painted on with a paint brush; I actually watered mine down with a little bit of water to make it go on more smoothly. Is your family making Valentines this year? Do you have any favorite Valentine’s Day activities for us to try? My kids enjoy making these cute color-me heart friends, and they have also made little felt hearts for friends. The heart-themed sensory board we made last week is still very popular with five-year-old Lily and two-year-old Anna especially, and this little heart guy that Emma made in kindergarten remains one of my favorite Valentine’s Day crafts. I love how those turned out! We’re making some, but haven’t made a whole bunch yet. Is it bad that I am secretly relieved about the fact that my daughter will miss Valentine’s Day in school, since she is traveling? Love Emma’s cards – they are so pretty! I understand the feeling. Valentine’s Day is often a lot of work for parents! How pretty MaryAnne! I love burlap textures. We have several pieces of burlap we received as wrappers for presents. Have to use some to make these! Thanks for sharing this idea! This is a great re-purposing project for burlap wrappers! Thanks for making an A4 version! So thoughtful! We don’t really celebrate Valentines Day here with our kids, though, just my husband and I. :) Your burlap hearts are lovely and your freehand cutting skills are amazing! I am going to try to include A4 versions for all printables going forward. It isn’t hard to do and makes things much easier for non-US friends! These Valentine’s are so pretty!! Where do you get red burlap? (if I am too late to order online). Can I find it at Joann’s Fabrics do you think?